Coffee has huge importance to many smallholder farmers around the world. The success of a year’s coffee crop can mean the difference between having enough cash in hand for buying food and watching your household go hungry. For many, it is the crucial component of their food security, even though coffee is not an edible crop. As is true for many agricultural products, the process for growing coffee is complex. Increased use of fertilizer and pesticides will likely lead to higher crop yields, but at significant cost to wildlife populations and human health. Using fewer agrochemicals is more environmentally friendly, but requires farmers to face increased risks of losing crops to pests and disease. A forthcoming paper led by researcher Juan Nicolás Hernandez-Aguilera, a postdoctoral scientist at the International Research Institute for Climate and Society, suggests this trade-off may not be as straightforward as previously thought, and that farmers could be better off financially if they used shade-growing practices for part of their production. The paper will be published in the May issue of the journal Ecological Economics. No previous study has quantified the economic trade-offs a smallholder farmer would experience in shifting from conventional coffee-growing to shade-grown. Hernandez-Aguilera and his colleagues developed a model to evaluate the financial costs and benefits for farmers. They examined a number of factors, including the cost of planting new trees, the price premiums that coffee consumers are willing to pay, and the potential yields farmers could see. The model suggests that farmers can optimize their coffee profits by converting a third to two-thirds of their acreage to shade-grown production. 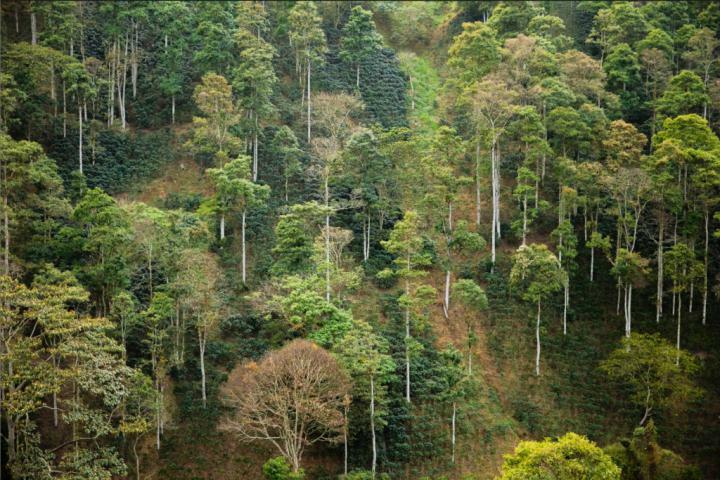 Usually, coffee is grown in homogenous fields of trees in full sun. Hernandez-Aguilera and his coauthors from Cornell University examined the merits of an alternative method of growing coffee, in the understory of shade-bearing trees. Shade-grown production systems mimic a forest structure and provide better habitats for birds than do full-sun systems. Both the birds and the shade trees provide ecosystem services to the coffee plantations, which can replace fertilizer and pesticides and save the farmer money. Birds prey on insect pests; some estimates suggest that a single bird could help save as much as 65 pounds of coffee per hectare every year from pests. Additionally, shade trees in shade-grown coffee plantations, often the species Inga edulis, fix nitrogen in the soil, providing the coffee trees additional nutrients. Hernandez-Aguilera notes that other services provided by this system include a reduction in temperatures beneath the shade trees, a crucial adaptation strategy for climate change. Coffee is also an important crop in many of the developing countries in which IRI is currently working. Hernandez-Aguilera’s study paves the way for further research into how to make growing coffee a more secure and financially stable source of income for farmers who often operate on tight margins under highly variable climate conditions. Through IRI’s work with Adapting Agriculture to Climate Today, for Tomorrow (ACToday), a part of Columbia World Projects, careful consideration is being given to coffee farmers in Vietnam, Guatemala, Colombia, and Ethiopia.